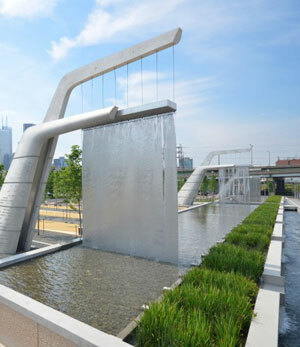 From here on, all major urban parks need to be like Sherbourne Common in Toronto, which not only provides a remarkable public space but also doubles as water treatment infrastructure. 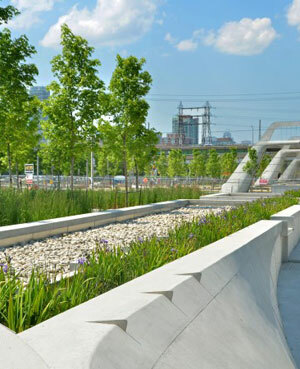 In a marvel of thoughtful design and engineering, the new 3.6-acre, $30 million park commissioned by Waterfront Toronto and designed by a team led by landscape architecture firm Phillips Farevaag Smallenberg uses ultraviolet light to clean polluted water coming in from Lake Ontario. 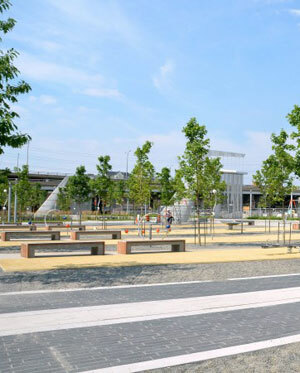 Given not-in-my-backyard (NIMBY) obstacles in cities are only expected to persist in the near term, these types of hybrid park-infrastructure projects make great sense, particularly given few communities can afford to build expensive, single-use “dumb” infrastructure. Many communities may jump at the chance for a beautiful park that does so much more. IMBY please? As for the park itself, the review is positive: “the tectonic detailing is superb: in the chic ipe wood and back-lit acrylic benches; in the custom recessed lighting on the ground; in the park pavilion’s panels custom cut to fit custom curves.” (Unfortunately, though, there’s more of that unsustainable ipe hardwood [see earlier post]). Light artist Jill Anholt’s use of light to create an “eerie blue aura” helps create the sense that advanced technologies are at work, but when visitors pass by a set of “watery veils,” motion detectors briefly turn the lights green. 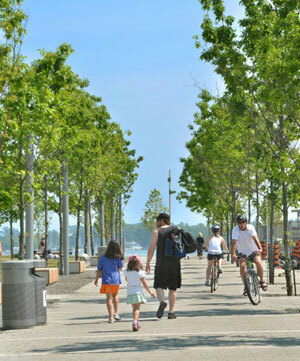 Overall, the city spent $27 million Canadian to not only transform an “underused land” in the city, but also create a public asset that will provide a great return on investment through “enhanced tourism for Toronto, “invigorated neighborhood communities,” and a “rebranding of the city as a place with an intelligent future.” Along with the city’s parks department, Waterfront Toronto, the innovative public program to transform the way the city connects with its waterfront and revitalize the city in the process, played a major role in ensuring “what might have been another pretty park has become a subtle intertwining of public art, architecture, landscape and sustainable infrastructure.” Their imaginative, award-winning landscape architecture plans and projects, including the new Spadina Wavedeck and HtO park, and upcoming underpass park, have already helped set the model for what a city can do. More projects are underway: a total of 800 hectares are targeted for redevelopment over 25 years. 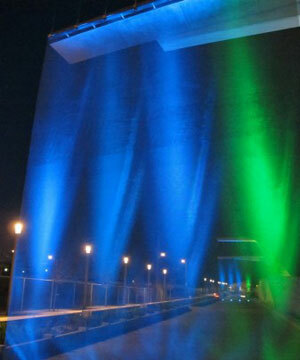 Public artist Jill Anholt created the “blue light monuments” and Toronto architect Stephen Teeple created the pavilions. Phillips Farevaag Smallenberg also brought in the Municipal Infrastructure Group Ltd. for the stormwater management systems, and Trojan Technologies for the ultraviolet water disinfection system. Learn more about this park, and see more photos and videos. Also, check out the final designs of the upcoming Oregon Sustainability Center, which will achieve net-zero energy and water use. Very nice project. I would be very curious how the maintenance works. Which division has the responsibility and costs on-going. We would love to do more joint projects in our county, but we find they become battles over funding and on-going maintenance. In this era of austerity this is no small hurdle to overcome. I would like to think our neighbors to the north are more enlighted in their management of projects such as this.